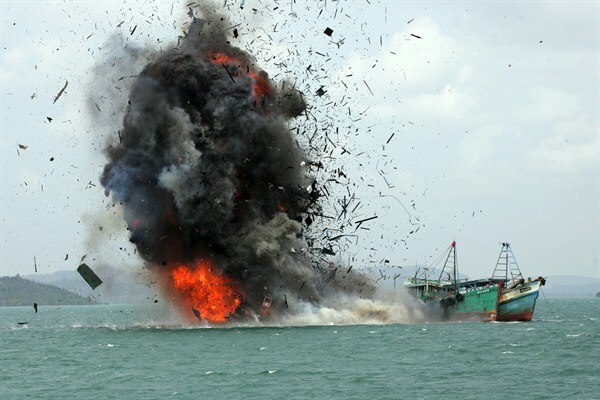 The Indonesian navy scuttles foreign fishing vessels caught fishing illegally in Indonesian waters near Bitung, North Sulawesi, on May 20, 2015. James G. Stavridis was the 16th supreme allied commander at NATO and is dean of the Fletcher School of Law and Diplomacy at Tufts University. Johan Bergenas is senior director for public policy at Vulcan Inc. This week, as part of the pending National Defense Authorization Act, Congress asked the Navy to help fight illegal fishing. Greater military and diplomatic efforts must follow. Indeed, history is full of natural-resource wars, including over sugar, spices, textiles, minerals, opium and oil. Looking at current dynamics, fish scarcity could be the next catalyst. The decline in nearly half of global fish stocks in recent decades is a growing and existential threat to roughly 1 billion people around the world who rely on seafood as their primary source of protein. No other country is more concerned about the increasingly empty oceans than China, whose people eat twice as much fish as the global average. Beijing is also the world’s largest exporter of fish, with 14 million fishers in a sector producing billions of dollars a year. In order to keep its people fed and employed, the Chinese government provides hundreds of millions of dollars a year in subsidies to its distant-water fishing fleet. And in the South China Sea, it is common for its ships to receive Chinese Coast Guard escorts when illegally entering other countries’ fishing waters. As such, the Chinese government is directly enabling and militarizing the worldwide robbing of ocean resources. 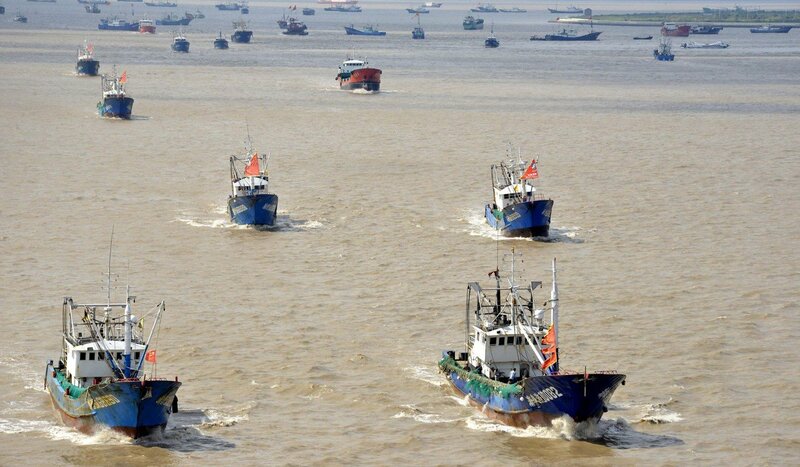 Fishing boats are put out to sea in Zhoushan, in China’s Zhejiang province, on Sunday. The annual summer fishing ban, enforced on May 1 in the East China Sea, was scheduled to end on Friday, but Typhoon Talim delayed the start of fishing until Saturday. The deployment of both hard and soft power to acquire natural resources is nothing short of hybrid warfare. Countries on the receiving end of Chinese actions are responding in kind: Indonesia has blown up hundredsof vessels fishing in their waters illegally; Argentina sank a Chinese vessel illegally fishing in its waters last year; and South Africa continues to clash with Beijing over fishing practices. Recently, Ecuador summoned the Chinese ambassador to condemn China’s fishing in Ecuadoran maritime territory following the seizure of 300 tons of illegally sourced fish. The United States could be next. Chinese vessels are increasingly fishing near our waters and are seeking to expand their footprint in the Caribbean. Emptier oceans also lead to increased transnational crimes. The commander of the Navy’s 5th Fleet noted this year that “out-of-work fishermen” are often involved in weapons smuggling for countries such as Iran. Drug traffickers also use fishing vessels around the world, including U.S. waters. This summer in Miami, U.S. Customs and Border Protection interdicted a fishing vessel from the Bahamas carrying 150 pounds of cocaine. These practices are rampant in Central and South America. (AP photo by M. Urip). Dozens of international treaties govern the protection of marine resources, but significant enforcement gaps exist that substantially reduce their effectiveness. The U.S. Navy is better suited to help close this gap than any other institution in the world. And while the Navy already recognized in its 2015 strategic blueprint that combating illegal fishing is part of its mission, the recent congressional action provides an opportunity for the Navy and partners to increase its role. To that end, the Navy should expand its partnership with the Coast Guard through the Oceania Maritime Security Initiative, which allows both military branches to enforce fisheries laws, combat transnational organized crime and enhance regional security in the Central and South Pacific. This program should be replicated in other ocean territories. The United States can also revitalize efforts by including fighting illegal fishing as part of the mission of the Combined Maritime Forces, a voluntary maritime security initiative with 32 member nations that operates to combat terrorism and piracy and provide overall maritime security. Fighting illegal fishing is not part of the group’s mission, but in light of the geostrategic challenges associated with it today, member countries should reconsider its inclusion. Dead sharks are found in a ship’s hold, at sea, off the coast of Com in East Timor, in this undated photo made available by the Sea Shepherd Conservation Society on September 15. 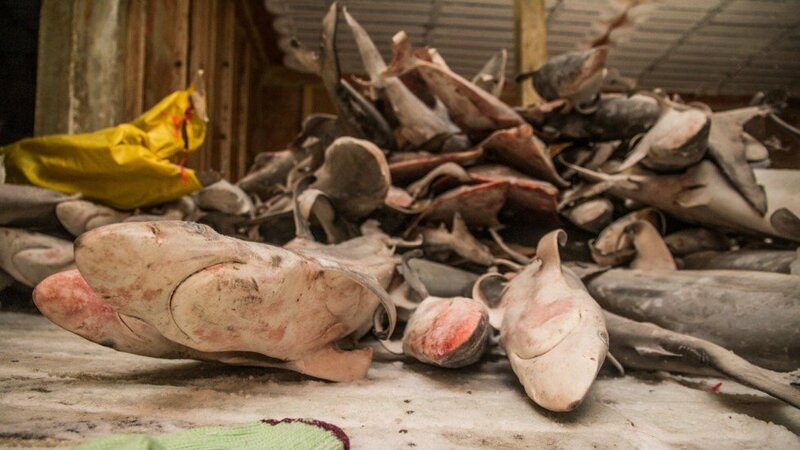 The environmental protection group said it led East Timor police to a Chinese-owned fishing fleet with an allegedly illegal cargo of sharks. China’s boats do contribute significantly to illegal fishing but – at least from China’s perspective – not in Southeast Asian countries’ claimed waters in the South China Sea. Diplomatic efforts must be increased as well, starting with elevating environmental-crime issues, such as illegal fishing, within the U.S. government. President Trump began that process this year by incorporating wildlife crime as part of an executive order on combating transnational organized crime. Trump should also recognize illegal fishing as a direct threat to U.S.
interests in his National Security Strategy this fall. Coupled with the congressional defense authorization, this would send a strong message to countries and criminals that the pillaging of our oceans is a serious threat to the United States — one that we must confront. WPR : The Next Resource War May Be Over Illegal Fishing. Is the U.S. Ready?